Frank Enrico Pastore was born on August 21, 1957 in California. 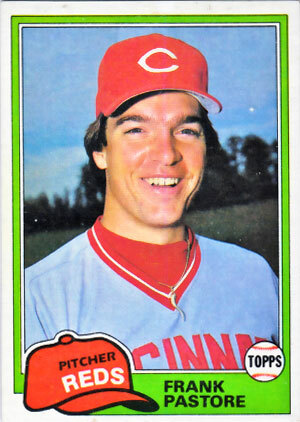 The six foot two inch right hander was the Cincinnati Reds second round draft pick in 1975. Getting signed at age 18 while still in high school. He spent four years in the minors with a best 7-2 record at AAA Indianapolis in 1979. That year he was called up to the Reds staff and would spend seven years there. He had his best season in 1980 going 13-7 with a 3.27 ERA, pitching nine complete games (7th in the NL) with two shut outs. He posted 110 strikeouts in 184 innings of work. 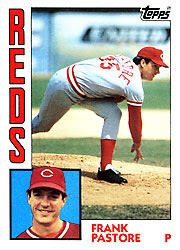 He then had losing records the next four years, losing a spot in the rotation by 1984, moving to the bull pen. In 1986 he signed with the Minnesota Twins as a free agent and went 3-1 with two saves in 33 games posting a 4.01 ERA. He finished his eight year MLB career at 48-58 with a 4.29 ERA. Pastore struck out 541 batters with 301 walks in 986 innings pitched in 220 appearances. trivia: In 1987 at The Big Texas Restaurant on Route 66 in Amarillo Texas, Pastore ate a 72 ounce steak, with shrimp cocktail & baked potato in seven ½ minutes, breaking the establishments all time record. He had attempted the feat over seven times during 11 years of Spring Trainings. Retirement: After baseball he studied at various universities, earning degrees in business administration, philosophy of religion and ethics, political philosophy, and American government. In 2004 he began the Frank Pastore Radio Show on KKLA 95.5 FM in Los Angeles. It is the largest Christian talk show in America. Pastore is a right wing conservative & published an opinion piece in 2005 entitled "Christian Conservatives Must Not Compromise “in the L.A. Times.